Although exosomes had long been considered to be involved in release of unnecessary cell contents, exosomes are recently attracting attentions of researchers as new mediators of cell-cell communication transporting biomolecules such as lipids, proteins, and RNAs in vivo. In addition to clarifi cation of physiological or pathophysiological functions of exosomes, research aiming at clinical application of these functions is rapidly in progress, particularly focusing on diagnostic and therapeutic application as well as development of biomarkers. Current exosome research covers almost all research areas in biomedical science (immunology, neuroscience, oncology, endocrinology, and cardiovascular research). For example, exosomes derived from immune cells have been shown to contain antigen peptide/MHC complexes and various antigens, which suggests a possibility that exosomes might regulate various immune responses such as activation/inactivation of immune cells in addition to the exchange of antigenic information between immune cells.3) In the nervous system, exosomes have been found to be involved not only in regulation of neural circuits4) but also in extracellular release of proteins causing various neurodegenerative diseases for subsequent transmission to other cells, a process that might be deeply involved in disease progression.5) Exosomes released by cancer cells contain many biomolecules related to angiogenesis and immune evasion, suggesting that they might contribute to construction of microenvironment optimal for cancer cell growth and promotion of cancer progression.6) In addition, the expression profile of adhesion molecules on the surface of exosomes from cancer cells has been shown to determine the destination of cancer metastasis.7) Recently, exosomes released from adipocytes have been reported to regulate gene expression in the liver.8) Furthermore, while many viruses leave cells by utilizing the pathway for exosome production, bacteria and parasites infecting cells are likely to regulate activities of bacteria/parasites infecting other cells via exosomes.9, 10) Most of the above-mentioned functions are mediated by secretory cell-derived biomolecules located within exosomes. In particular, since mRNAs and miRNAs of secretory cell origin were identified in exosomes, potential involvement of exosomes in horizontal transmission of gene expression information between cells has been attracting great research interest.11) Since these RNAs are encapsulated within the lipid bilayer membrane of exosomes, they are not susceptible to degradation by RNase and remain intact in blood or other body fluid. Exosomes incorporated into target cells fuse with the endosome membrane to release encapsulated RNAs into the cytosol of target cells. Once released into the cytosol, mRNAs are translated into proteins while miRNAs suppress translation of target genes. Thus, exosomes regulate gene expression within target cells. A single exosome is considered to contain more than several ten-thousands of proteins and more than several thousands of mRNAs and miRNAs. The composition of these biomolecules may vary depending on the type and conditions of a secretory cell which originally harbored the exosome. In addition, the composition of proteins, mRNAs, and miRNAs within an exosome is different from that within the original secretory cell, which suggests the existence of a mechanism selectively loading exosome- specific proteins and mRNAs/miRNAs into exosomes. Such specific composition of exosome RNAs makes them attractive candidates for biomarkers and targets for therapeutic development. While mRNAs within exosomes incorporated into target cells are capable of inducing expression of functional proteins, most miRNA within exosomes are present as precursors of functional miRNA and their physiological significance is under extensive investigation. Thus, since exosomes contain a wide variety of proteins, RNAs, and lipids, construction of an exosome database "ExoCarta" is currently ongoing through claassification by cell types. Furthermore, while large scale analysis of exosomes utilizing cutting-edge methodologies in proteomics, transcriptomics, and system biology are separately conducted in laboratories all over the world, EV plugin for FunRich (a stand-alone functional enrichment analysis tool) is distributed aiming at a common and integrated analysis tool. Sharing information among researchers in a wide variety of research fields is essential for promotion of future exosome research. In parallel with clarification of exosome functions, efforts to develop therapeutic methods applying exosome functions are being continued in recent years. For example, exosomes released from blood fibrocytes (a population of mesenchymal progenitors) accelerate wound healing by stimulating angiogenesis and inducing migration and proliferation of keratinocytes. Proangiogenic, anti-inflammatory miRNAs as well as a miRNA promoting collagen deposition within these exosomes are reportedly involved in this process.12) In addition, exosomes released from dendritic cells in patients with cancer contain a variety of cancer cell-derived proteins and induce intense activation of cancer cell-specific cytotoxic T lymphocytes. Development of cancer immunotherapy based on this mechanism is currently in the early phase of clinical research.13) On the other hand, suppression of exosomal functions involved in pathogenesis has also been attempted. For example, apoptosis- inducing TNF-α is accumulated at high concentrations in exosomes released from synovial fibroblasts in patients with rheumatoid arthritis and exacerbates the pathology of rheumatoid arthritis.14) In addition, since cancer cellderived exosomes contain molecules related to cancer progression and neuron-derived exosomes contain molecules related to neurodegenerative diseases as described above, inhibition or removal of these exosomes may potentially suppress onset of these diseases. Advancement of future research is expected to clarify exosome functions and expand indications of clinically applied exosomes, thereby realizing utilization of exosomes for the treatment of various diseases. Furthermore, delivery of drugs such as siRNAs and anticancer agents to target cells using exosomes has been attempted. Since various cell adhesion molecules are expressed on the surface of exosome membrane and the expression profile of these molecules has been found to determine the target cells for exosome delivery, application of this property to development of a new drug delivery system (DDS) is expected.15) Exosomes are extremely stable in body fluids, and the exosome lipid bilayer membrane encapsulating proteins and RNAs within vesicles protects them from degradation. Furthermore, exosomes remain relatively intact even in body fluid specimens stored for a long time after collection and are therefore considered as new and promising laboratory biomarkers for diseases. While correlations between exosomes and various diseases have been investigated, cancer cell-derived exosomes released into blood are recently attracting research interest due to difference in constituents from normal cell-derived exosomes and a correlation between constituents of cancer cell-derived exosomes and cancer progression has been extensively investigated as a potential tool for early cancer diagnosis.16) In addition, exosomes in urine are expected as a new diagnostic marker for renal, prostate, and bladder diseases, while exosomes in cerebrospinal fluid as a new marker for brain tumor and neurodegenerative diseases. Although many studies on roles of exosomes have already been reported, experiments providing evidence for these reported phenomena use highly concentrated exosomes purified from body fluids and cell culture supernatants. Accordingly, whether these phenomena actually occur in vivo remains unclear. The sole approach for clarification of physiological actions of exosomes is to clarify the mechanism of exosome release and physiological phenomena induced by exosome release stimulation/inhibition through modulating the mechanism, which is expected to result in further advancement in exosome research. Another important issue to be addressed in future research and development is in vivo kinetics of exosomes (i.e., which exosomes are directed to which target cells). Conventional methods for exosome purification mainly involved ultracentrifugation and various commercial purification kits using polyethylene glycol (PEG) precipitation technique. However, exosome preparations obtained by these methods contain large amounts of contaminants and careful analysis is required to determine whether experimental results obtained are actually due to actions of exosome constituents per se. Furthermore, ultracentrifugation requiring cumbersome manipulation has several disadvantages including inconsistent recovery interfering quantitative analysis and requirement for an expensive instrument not compatible with high-throughput analysis. Conducting exosome research under these circumstances is difficult and development of technology for easy purification of exosomes at a high purity is urgently needed. We focused on Tim4, an exosome receptor expressed on macrophages, and prepared "Tim4 magnetic beads" by immobilizing the extracellular region of Tim4 on magnetic beads.17) Since Tim4 binds to phosphatidylserine (PS), a phospholipid on the surface of exosome membrane, in a calcium ion-dependent manner, bound exosomes are released from these beads with an elution buffer containing ethylenediaminetetraacetic acid (EDTA), a chelating agent, to obtain highly purified intact exosomes. In fact, when exosomes released from human leukemia cells were purified by the Tim4-affinity method and compared for purity with exosomes purified by ultracentrifugation and PEG precipitation, the Tim4-affinity method yielded exosome preparations with exosome-specific proteins each exhibiting a band intensity over 10-100 times higher than that obtained by other methods and almost free from non-exosome contaminants, thereby demonstrating reproducible recovery of high-purity exosomes. As a result, many previously unidentified exosome proteins and RNAs could be identified from exosome preparations obtained by this method. Furthermore, application of the strong binding affinity of Tim4 toward exosomes realized high-sensitivity detection and assay of exosomes by enzyme-linked immunosorbent assay (ELISA) and fluorescence-activated cell sorting (FACS). On the other hand, while only crude preparations of microvesicles were conventionally obtained because differential centrifugation was the sole purification technique available, the Tim4-affinity method realized purification of microvesicles at a high purity as well. Details of these techniques are described in this guidebook. We expect that usefulness of these Tim4-affinity-based techniques will be appreciated in the world and greatly contribute to clarification of the original physiological functions of exosomes and microvesicles. In addition to difficulties in detection and isolation of exosomes, the existence of various classification systems for exosomes and resulting lack of consensus among investigators regarding which method should be used for purification of the extracellular vesicles to be called "exosomes" make interpretation of experimental data and confirmation of reproducibility difficult. To overcome such situation, the International Society for Extracellular Vesicles (ISEV) has recently been established to nurture a global community of EV researchers and "Minimal Information for Studies of EVs" (MISEV) Guidelines has been published as international standard that investigators who intend to start EV research should consult.18, 19) In addition, as a method for avoiding such confusion, EV-TRACK knowledge database has been constructed to record experimental conditions employed in individual EV-related articles.20) On the other hand, as EV research has attracted global research interest, a number of large-scale research projects have been launched in various countries. In the United States, National Health Institute (NIH) has initiated a strategic large-scale project "Extracellular RNA Communication" and special interest groups on EV research have been organized at prestigious international conferences such as Gordon Conference and Keystone Symposia since 2016. In Europe, research covering EV has already been conducted as a part of CANCER-ID project supported by "Innovative Medicines Initiative (IMI)," a public-private partnership (PPP) for research and development of medicines. In Japan, EV research has been selected as one of the Research and Development Strategic Objectives in 2017 established by the Ministry of Education, Culture, Sports, Science and Technology Japan and acceleration of future research in this field is expected. In any case, development of solid research methodologies and techniques that constitute the basis of EV research is essentially required for future advancement in this research field, and we expect that the Tim4-affinity method will grow up to be one such technique. Bobrie, A., Colombo, M., Raposo, G. and Thery, C. : Traffic, 12 (12), 1659-1668 (2011). Bahrini, I., Song, J. H., Diez, D. and Hanayama, R. : Sci. Rep., 5, 7989 (2015). Kramer-Albers, E. M. and Hill, A. F. : Curr. Opin. Neurobiol., 39, 101-107 (2016). Tkach, M. and Thery, C. : Cell , 164 (6), 1226-1232 (2016). Hoshino, A. et al. : Nature, 527 (7578), 329-335 (2015). Thomou, T. et al. : Nature, 542 (7642), 450-455 (2017). Izquierdo-Useros, N., Puertas, M. C., Borras, F. E., Blanco, J. and Martinez-Picado, J. : Cell. Microbiol., 13(1), 10-17 (2011). Regev-Rudzki, N. et al. : Cell, 153 (5), 1120-1133 (2013). Valadi, H. et al. : Nat. Cell Biol., 9 (6), 654-659 (2007). Geiger, A., Walker, A. and Nissen, E. : Biochem. Biophys. Res. Commun., 467 (2), 303-309 (2015). Bell, B. M., Kirk, I. D., Hiltbrunner, S., Gabrielsson, S. and Bultema, J. J. : Nanomedicine, 12 (1), 163-169 (2016). Zhang, H. G. et al. : J. Immunol., 176 (12), 7385-7393 (2006). Batrakova, E. V. and Kim, M. S. : J. Control. Release, 219, 396-405 (2015). Thind, A. and Wilson, C. : J. Extracell. Vesicles, 5, 31292 (2016). Nakai, W. et al. : Sci. Rep., 6, 33935 (2016). Witwer, K. W. et al. : J. Extracell. Vesicles, 2 (2013). Lotvall, J. et al. : J. Extracell. Vesicles , 3, 26913 (2014). EV-TRACK Consortium, Van Deun, J. et al. : Nat. Methods, 14 (3), 228-232 (2017). Exosomes are membrane vesicles (30-100 nm in diameter) released from various cells and shown to function as transmitters of encapsulated nucleic acid (mRNA, microRNA) and proteins between remote cells. Their roles as a communication tool in cell-cell signal transduction and as a potential biomarkers for various diseases including cancer have recently been attracting research interest.1, 2) Accordingly, exosome research has been spreading across a wide variety of research areas in recent several years. Nevertheless, experimental techniques currently available for exosome research are still under development and many issues remain to be improved. For example, among conventional techniques for exosome purification, ultracentrifugation and polymer precipitation (commercially available kits) have been shown to yield exosome preparations with large amounts of contaminants that seriously interfere with subsequent experiments. On the other hand, antibody-based affinity method and density gradient centrifugation are capable of purifying highly purified exosomes but are incapable of yielding intact exosomes, thus it is difficult to analyze their original physiological functions of exosomes. Furthermore, Western Blotting and ELISA widely used for exosome detection have several disadvantages including the requirement of relatively large amounts of exosomes and difficulties in the detection of lowexpression marker proteins. Accordingly, we have developed a new exosome analysis tool to resolve various problems in experimental techniques for exosome research as mentioned above. This new technique is described below. Data on isolation of high-purity extracellular vesicles using MagCaptureTM Exosome Isolation Kit PS are presented on pages 7-13, while data on high-sensitivity detection of extracellular vesicles using PS CaptureTM Exosome ELISA Kit PS are shown on page 16 and thereafter. Based on these findings, we developed a new and unprecedented method for exosome purification using Tim4-immobilized magnetic beads (capable of capturing exosomes in samples such as culture supernatants and serum in the presence of calcium ions and releasing them by elution with a buffer supplemented with a chelating reagent) in collaboration with Professor Rikinari Hanayama (Department of Immunology, Kanazawa University Graduate School of Medical Sciences) and successfully constructed an exosome purification kit based on these magnetic beads.5) This exosome purification kit, MagCaptureTM Exosome Isolation Kit PS, has realized easy purification of intact exosomes with higher purity than that obtained by any conventional methods for exosome purification. It is currently being established as a new exosome purification method replacing ultracentrifugation, the conventional gold standard. Tkach, M. et al. Communication by Extracellular Vesicles : Where We Are and Where We Need to Go. Cell 164, 1226-1232(2016). Raimondo, F. et al. Advances in membranous vesicle and exosome proteomics improving biological understanding and biomarker discovery. Proteomics 11, 709-720（2011）. Trajkovic, K. et al. Ceramide triggers budding of exosome vesicles into multivesicular endosomes. Science 319(5867) : 1244-7(2008). Miyanishi, M. et al. Identification of Tim4 as a phosphatidylserine receptor. Nature 450, 435-439(2007). Nakai, W. et al. A novel affinity-based method for the isolation of highly purified extracellular vesicles. Sci. Rep. 6, 33935(2016). Extracellular vesicles are captured by phosphatidylserine (PS)-binding proteins and metal ions, then captured extracellular vesicles are eluted with a chelating reagent. Microplate wells, pre-coated with anti-CD antibodies (CD9, CD63, CD81) and Tim4 were incubated with nine types of pretreated ※ 1 cell culture supernatants. Captured exosomes on the plate were detected using biotinylated anti-CD antibodies (CD9, CD63, CD81). ※ 1 Pretreatment condition: 10,000 x g, 30 min. Compared with anti-exosomal marker antibodies, Tim4 was able to efficiently capture exosomes derived from a wide range of cell types. From cell culture supernatant samples of various cell type and human serum samples obtained by centrifugation at 10,000 x g, exosomes were isolated and purified by PS affinity method and ultracentrifugation method. Then, purified exosomes were measured for signals of CD81 using PS Capture™ Exosome ELISA Kit. From absorbance of each sample, the amount of residual exosomes in a post-purification sample and the recovery rate of exosomes were determined for comparison. The PS affinity method was found to be more efficient in recovering exosomes from various cell lines and serum than the ultracentrifugation method. We developed PS Capture™ Exosome ELISA Kit by applying affinity binding of Tim4 protein with exosomes. This kit is capable of detecting exosomes at a sensitivity higher than that of conventional ELISA methods immobilization of antibodies against exosome surface markers. Exosomes in samples such as culture supernatants and serum are captured by Tim4 protein on adry plate in the presence of calcium ion. 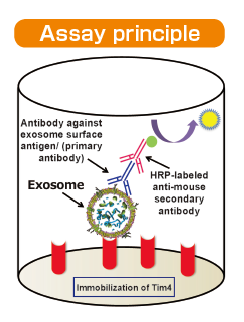 The captured exosomes are detected by a primary antibody against an exosome surface marker protein and a labeled secondary antibody. While a mouse anti-CD63 monoclonal antibody is provided with the kit, a user-provided mouse primary antibody against any other exosome surface marker may also be used for exosome detection. The greatest feature of this kit is that it provides exosomes detection with higher sensitivity than that of Western Blot analysis and conventional product for exosome ELISA. First, the detection limit for exosomes in Western Blotting was examined for comparison with this kit (Figures 1a and b). Western Blot analysis of exosomes purified from COLO201 cells (of human colon adenocarcinoma origin) with an anti-CD63 monoclonal antibody detected exosomes in an amount as small as 75 ng on the protein basis. Next, the detection limits of this kit for exosomes purified from K562 cells (of human leukemia origin) and COLO201 cells were determined to be 49.9 pg and 10.9 pg, respectively, demonstrating that this kit had a detection sensitivity more than 1,000 times higher than that of Western Blotting (Figure 1c). Considering that the detection limits of conventional products for exosome ELISA range approximately several ng to several μg (refer to instruction manuals for individual products), the present results demonstrated that this kit utilizing affinity binding of exosomes to Tim4 via PS has a sensitivity more than 100 times higher than those of conventional ELISA methods involving immobilization of an antibody against an exosome surface protein marker. PS ELISA detected the marker proteins with 50-1,000 times higher sensitivity than WB. (a), (b) Result of sensitivity by Western Blot with each of anti-CD63 antibody (supplier A and Wako: Code No. 012-27063).